Grainger Public Relations » New Course for High Fliers Takes Off! One of the new recruits is Abbie Chalmers (19) from Glenrothes. 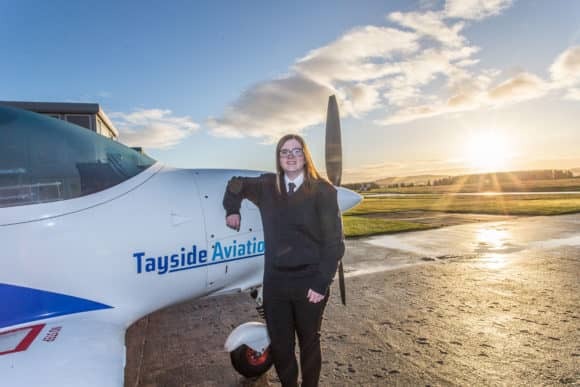 A former pupil of Glenrothes High School, Abbie hopes to succeed in the 12 week course, commence the degree in April and, ultimately, become a commercial pilot. The course includes 45 hours of flying instruction, night rating, a two day maths and physics course, pre and post flight briefings, a PPL study pack and uniform. The course also includes all ground school classes, which run to around 50 hours, free landings at Dundee and Fife Airports, one year’s free membership of Tayside Flying Club and insurance. On completion of the IFT, students will gain a place on the degree programme which is run by Tayside Aviation in conjunction with Middlesex University and Aviation Skills Partnership. There are currently over 40 students working towards their degree. Launched in January 2015, the BSc (Hons) Professional Aviation Pilot Practice programme, the first of its kind available in Scotland, greatly increases and accelerates students’ chances of gaining employment as airline pilots in what is a highly competitive industry. The degree aims to enhance students’ career progression within the industry and hopefully attract more females into the career who currently represent less than 10% of the UK’s commercial pilot cohort. Students must be at least 17 years of age – full entry requirements for the course can be viewed at www.taysideaviation.com or by calling (01382) 644372. Tayside Aviation also holds monthly open days to provide information and course overviews. To register your interest, visit recruitment@taysideaviation.com.